Rap star, Da Brat is gonna pay twice for violently bottling a former NFL cheerleader inside an ATL nightclub back in 2007. After serving more than 3 years in prison for the crime, the rapper now has to pay the victim $6.4 MILLION. Shayla Stevens -- who used to cheer for the Atlanta Falcons -- sued Da Brat in 2009, while the rapper was serving her prison sentence after pleading guilty to aggravated assault. The civil trial hit a stumbling block Wednesday when a juror in the case admitted he wasn't a U.S. citizen -- but the new jury quickly reached a verdict today. 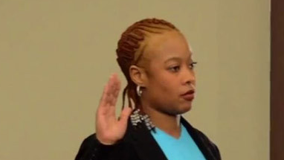 The jury found Da Brat -- real name Shawntae Harris -- responsible for causing Stevens' permanent facial scarring, neurological impairment, and severe mental pain. Lil Kim sued for $15 million!